A beautiful handmade sequin star Christmas tree decoration in snowy white which will sparkle under Christmas tree lights. These Christmas decorations would look wonderful on your tree, they also make very special gifts, presents for crackers or stocking fillers and are a perfect match for our blue or silver decorations to create a modern and "cool" colour scheme. 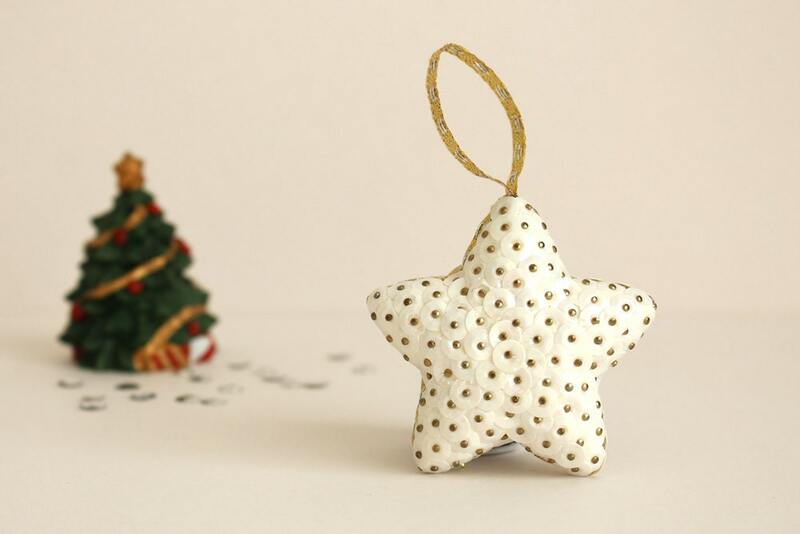 The Christmas decoration has been made from high density polystyrene and has been wrapped in gold ribbon to create a hanging loop, and then covered in white sequins which will twinkle on the tree. DISCLAIMER: Each sequin has been attached using small pins and there is no reason they should be removed. However due to the nature of the small parts these decorations are not suitable for small children. Very lovely and well made! They are absolutely beautiful and very well made. I was so pleased with them. Very beautiful, artfully crafted, great quality, packaged and presented well. Wonderful to give as gifts or keep to treasure! Where possible I will accept custom requests depending on workload. I can customise cards either making you something specific from scratch to the colours you require or to add a particular greeting. I am also able, where possible, to accept custom requests for fabric products such as bow brooches or hair clips and similar, to use fabric colours or patterns if I can source them. If you would like a product in bulk such a soap bars then please do contact me, I may be able to assist. If your custom request is high in value then you may be asked to pay 50% at the time of ordering and then a balance payment. UK orders are sent via Royal Mail First Class delivery (unless you pick another option) and so should usually arrive within 2-3 working days, although this may increase over the busy Christmas period. When placing an order you have the option to select Special Delivery before 1pm, please note however that if you place your order after 2pm it is possible that it might not make that days post, please contact me prior to ordering if your order is needed super quick and I will see what I can do! International orders are sent via Air Mail and should take between 3-21 days depending on where they will be heading. Custom Orders will take longer and I will let you know how long during the order process.